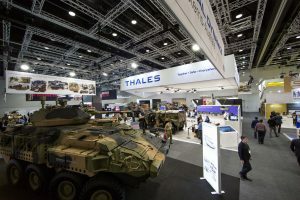 The Adelaide Convention Centre attracted a record number of delegates for Land Forces 2016, with 13,451 global delegates coming through the doors of the Centre over three days (September 6 – 8). The Land Forces attendance record saw defence industry representatives from 23 countries converging on Adelaide for the nation’s premier land defence exhibition. Twenty-two of the world’s armies were also represented through attendance at the Chiefs of Armies Exercise, with 16 countries sending their Chiefs of Army or Senior Army Commander. The biennial event took over the entire Centre with the bump-in of the largest exhibition ever held at the venue requiring 155 semi-trailers and trucks to deliver the state-of-the-art land warfare exhibits and technologies. 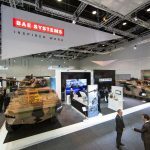 Exhibits included 30 tonne tanks, Bushmaster Protected Mobility Vehicle, weapons systems and ordnance, surveillance systems and training and simulation technologies. More than 500 exhibitors from 23 countries were represented at the international trade exhibition which occupied the Centre’s entire ground floor and foyers. Eleven conferences and seminars were held at the Centre as part of Land Forces including the Future Land Force Conference, Land and Environment Working Group Symposium and specialist seminars and symposia. They were attended by more than 1,000 delegates. Adelaide Convention Centre Chief Executive Alec Gilbert said Land Forces 2016 had provided an opportunity to demonstrate the full capabilities of the currently expanded Convention Centre. “Detailed planning and a close on-the-ground partnership with the event’s production manager ensured the event ran smoothly,” said Mr Gilbert. “Land Forces was a strategically important event for the Centre and South Australia as it provided a chance to showcase the State’s defence industry and capabilities to the world and build valuable networks with global industry leaders. The number of national and international delegates visiting Adelaide provided a significant economic boost to local hotels, restaurants, taxi drivers and other service providers. Land Forces visitors and conference delegates spent more than 3,000 bed nights at local Adelaide hotels. The event also provided strong demand for flights from national airlines, and the growing number of international airlines now servicing Adelaide. Land Forces 2016 Head of Production Jane Blackett said Adelaide and the Adelaide Convention Centre did an amazing job hosting Land Forces 2016. “We constantly pushed and tested the Centre and they responded by exceeding expectations with their expertise and personal, unflustered client service,” said Ms Blackett. “For us, being able to take over the whole venue gave us a significant advantage, both from a security and logistics perspective. “It gave us the ability to link the exhibition space out into the foyers and connect many facets of the show and have a single security entrance straight into the event. Minister for Defence Industries Martin Hamilton-Smith said we had great feedback throughout the event staged at the Adelaide Convention Centre. “Land Forces 2016 is expected to have injected more than $16 million into the state’s economy and showcased South Australia’s defence sector,” said Mr Hamilton-Smith. Adelaide has now been shortlisted as the destination for Land Forces 2018 with a decision due shortly.